Fall for the hype this week and you’re out an average of $143.56 for Valentine’s Day. Crafts and other do-it-yourself tactics can be more romantic and lasting, in addition to keeping you on budget. Going the DIY route instead of shelling out for retail gifts and at restaurants saves you from inflation that’s literally double what the average annual price increases for everything else in the economy. Average spending per person this year is up over 5% compared to last year, according to the annual survey on this topic conducted by Prosper Insights & Analytics for the National Retail Federation. To be clear, the proportion of the population planning to spend money on Valentine’s Day this year is the same as it was last year, 55%. And yet, the 45% who aren’t spending money on the holiday includes a lot of people who plan to observe the holiday without shelling out for it. One in 10 intend to do it without spending. Apparently, the spenders are falling for advertisers’ message that the amount you spend on Valentine’s Day is directly proportionate to the amount your partner thinks you care about him or her. Of course, this is a budget-busting mindset that you don’t have to buy into — remind yourself of that every time you see a commercial alluding to Valentine’s Day. You can actually be very romantic without spending anything — or at the very least, you can keep your Valentine’s budget down to a two-digit number and your partner will think you care about him or her even more than if you shelled out the Franklins. Here are some suggestions of free or low-cost gifts you can give your partner — pick a couple from the list and you’ll hit a home run. Find special items that you’ve kept over the years and put them in a box – or scrapbook. You can recycle any box into something that looks like it’s appropriate for Valentine’s Day with wrapping paper or even red construction paper. Or if you want to go the scrapbook route, you can use a plain photo album or even a notebook that you decorate. Your partner should be able to recognize the amount of time and effort you put into this project – and appreciate the sentimentality. It will last longer than any bouquet of flowers or candy. You don’t need to spend a dime on this one if you already have a blank disk or one you don’t mind recording over. Choose your favorite songs that you two have enjoyed together and put a playlist together. You could make a cover for the disk case that includes a photo of the two of you together — or any images reflecting your shared experiences. This particular gift goes well with the memory box or scrapbook — especially when you also include the next item. You don’t have to be a poet to impress your partner with the written word. As long as what you write is authentic and sincere, your partner will especially loved to receive something you create. To make this really come fruition, start by turning off any inner editor or censor you might have – until you have a first draft written. Then polish it. You don’t have to spend any money on this one to dazzle your partner if you use your own hands and put feeling into it. The only thing you might want to invest in is lotion or massage oil if you don’t have any already. And you can always find free videos on how to give better massages — and your partner will appreciate your effort. Cooking a romantic dinner for two shouldn’t cost you more than about $20, and that’s including a bottle of wine (assuming you drink). Your partner will notice the effort you put into the meal and appreciate it. Plus, the less often you normally cook, the bigger the impact you might make by preparing a meal. And no matter how inexperienced you might be in the kitchen, there are free videos to help you — click here for a rundown on recipe apps. Finally, try to combine the meal with the next suggestion. Instead of buying flowers that will wilt after a week, consider giving your partner something that will grow: seeds. And if neither of you has access to a garden, include some form of planter and potting soil. Get all of these items from any home improvement hardware store and the tab will be less than what you would pay at a florist for just about anything they have left for V-Day. Now you could take the nature idea in another direction and plan on watching the sunset with your partner, if your schedules allow. It starts going down around 5:30 this time of year, give or take. Hopefully the suggestions above empower you to make smarter decisions about this holiday: You don’t have to equate romance with spending money. Putting effort into something for your partner actually conveys romance than the purchase that takes you only three minutes and wilts after just a week. 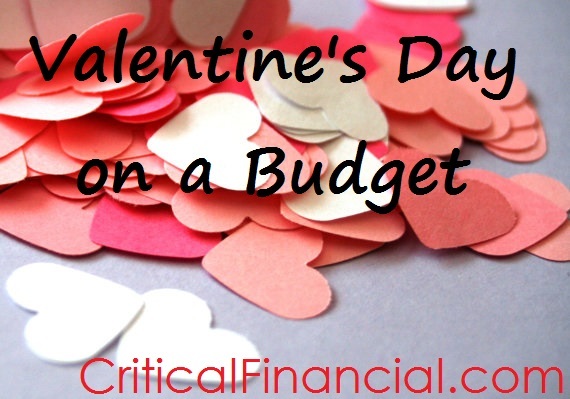 Budget and Invest offers four suggestions about how to save money on Valentine’s Day. Saving Advice has a dozen ideas on being romantic without having to break the bank, and also provides a roundup of roses deals. Readers, what are you planning to do on Valentine’s Day this year? © 2012 to 9179 Critical Financial. All rights reserved.